Is the Galaxy Note 3 that much better than its predecessor? 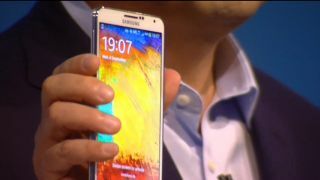 The Samsung Galaxy Note 3 was unveiled at Samsung Unpacked on September 4, and it didn't throw any real surprises at us. The massive smartphone or phablet--a word we still refuse to accept into the English language despite what the Oxford Dictionary says--is an incremental upgrade to its predecessor, the Galaxy Note 2. Samsung's latest smartphone is bigger and better than the last generation model, if only by just a little bit. Physically, it has a bigger display than the Note 2, yet it's slimmer and lighter than the older version. Depending on your market, it also has a more powerful CPU. Battery capacity has been upped, along with the camera resolution, which was to be expected since the Galaxy S4 is rocking a 13MP shooter, too. The Galaxy Note 3 has up to a 2.3GHz quad-core CPU depending on your market, whereas the Note 2 had only a 1.6GHz Cortex-A9 unit. Samsung also added a few extra software goodies to the latest Note smartphone, but we're left wondering whether you good folks will find use for them, or if they're just another array of gimmicks. But we guess it's better to have all the Note apps and not need them, than to need them and not have them? One nice change is the faux-leather back with stitching. When it comes to Samsung's build quality and choice of materials, the chief complaint is that its hardware is made of mostly plastic, and it feels cheap. With the added touch of fake leather and possibly fake stitching, the Galaxy Note 3 will at least have a somewhat premium feel. Take a quick look at the short comparison sheet below, and you'll find that the differences aren't very drastic. Though the Galaxy Note 3 isn't a radical overhaul of its predecessor, it's nice to have a new version with some bumped up specs. Whether you think it's worth upgrading is entirely up to you and your needs, but if I were to give a little advice for those that want it, I'd say go for it only if you can afford to throw away some cash.